By Matt Furber for the New York Times, FEB 25, 2014 – . 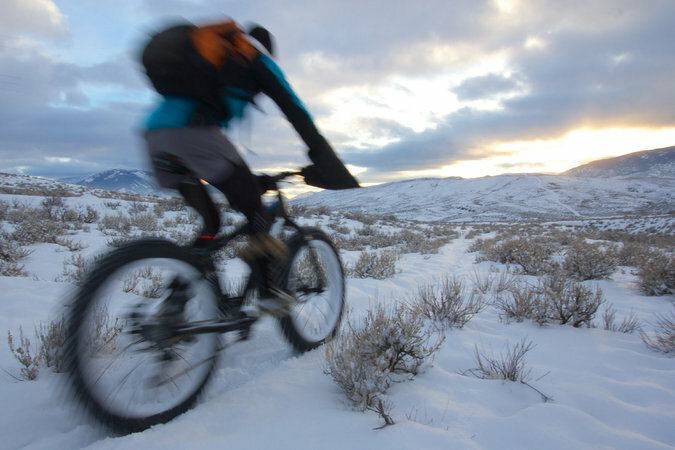 As a longtime mountain biker who finds peace in remote trail riding, I decided to experience the winter “fat bike” phenomenon for myself and took a road trip from Boise to test bikes in some of the state’s mountain haunts. It has been cold in Boise, which is 2,700 feet above sea level, but that hasn’t stopped riders of fat bikes, especially when it comes to fat-bike trials, including an event organized by Fat Bike Boise in early December (a celebration of Global Fat- Bike Day) on a thin layer of early snow preserved by the cold. It should be said that Boise on any bicycle is a compelling starting point for an adventure. Hotels and restaurants are a brief ride from the airport, and trailheads are a short distance from downtown. In Idaho riders learn to roll through stop signs, maintaining guiltless momentum on the way to places like Zoo Boise to see snow leopards because a 1982 rule dubbed the “Idaho Stop Law” permits cyclists to treat stop signs as yield signs. The first higher elevation stop on my biking quest was at 3,900 feet in Salmon, an outpost for the Continental Divide Trail, at the confluence of the Lemhi and Salmon rivers. Roads there wind through crinkled mountains that begin near places like the phenomenal lava fields of Craters of the Moon and rise to the north above the Snake River Plain that is bent like a fishhook through the southern part of the state — a dramatic landscape by any route. Salmon is a hunting and recreation gateway on the edge of the Frank Church-River of No Return Wilderness, a town steeped in Western lore and known as the birthplace of Sacagawea. My trip began at the Hub, a new bike and ski shop a block off Main Street that also serves pizza and beer. There I met the owner, Max Lohmeyer, a Fruita, Colo., native and lifelong mountain biker, who would take me for an evening ride on Discovery Hill. After exiting Mr. Lohmeyer’s van at the trailhead, we crunched on our bikes over thin patches of snow turned ice luge in some sections. In the dark, chips of snow that shot from the front tire glowed like welding sparks as they floated through the bright beam of my bike light. 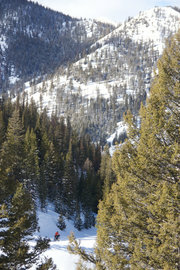 Traction on marginally snow-covered trails varied with pitch and aspect. Navigating surfaces and slopes was more fun than it may sound, which I attribute to the novelty of riding a super-fat mountain bike tire under the shine of a full moon. At times during our ride, some 13 miles through mountain desert country with the Salmon photographer David Lingle, we could see the lights of town below. In bed after enjoying the frontier night life, which included watching outdoor hockey, my mind continued to slip and slide — I was hooked on riding in the snow and excited to try it in the daytime too. To get to my next destination I drove through the wide valleys of the Lost River and Pahsimeroi mountain ranges to the Teton Valley, which has a large contingent of snow-sports people in the towns of Victor and Driggs. Snow biking is managed in conjunction with Nordic skiing at the base area of the Grand Targhee Resort at 8,000 feet in Alta, Wyo., and just over the border from Driggs. Groomed trails wind through the forest nestled in the backdrop of the Grand Tetons. Still, most of my group at Sun Valley Trekking remained committed, and we were admittedly nervous as we made final preparations. I fixed a flat tire, and Joe St. Onge, co-owner of Sun Valley Trekking and a professional ski guide, checked our avalanche transceivers and gave us a safety briefing — we would cross known avalanche paths on our way to Tornak. We began to ride and pushed our bikes through loose snow perfect for backcountry powder skiing if only the base were better. Pedaling when possible, I remembered advice I had received from Erwin Reitsma, a fellow racer at Grand Targhee: “Sometimes lower pressure is the difference between pushing and pedaling.” I let air out of my tires until the pressure was as low as three pounds per square inch. Soft tires provide better traction on soft snow. Tornak, situated in the Sawtooth National Recreation Area just below Fox Peak, looks like a longhouse and has ornately painted doors, a panoramic window facing the Boulder Mountains, comfortable bunks and a welcoming dining table, all set on a foundation of logs that were cut from standing dead trees in the woods around the structure. A hearty ration of pesto pasta, Belgian beer and pecan bars made by Joe’s wife, Francie, led to a long night of heady conversation, with heat provided by a wood stove and the glow by solar-powered lights. After a restful sleep and a breakfast of pancakes, hash browns and sausage, we were happy to discover that all our work on the ride up the mountain had helped pack down the trail. The track that took us more than five hours to ascend with plenty of pushing had stabilized enough in the night that we would pedal out in less than two. The Modern Hotel (themodernhotel.com) is a good base of operations. Rooms start at $101. A restaurant favorite is Àlavita (alavitaboise.com) for fresh pasta. George’s Cycles (georgescycles.com) has four locations that sell fat bikes. Meridian Cycles(meridian-cycles.com) is one of the few places in the Boise area that rents fat bikes ($50 per day). Salmon has several motels. Rooms at the Stagecoach Inn motel (stagecoachinnmotel.com), which accommodates pets, start at $84. Sacajawea Inn (hotelsalmon.com) has kitchenettes; from $53. The Syringa Lodge (syringalodge.com) has a bed-and-breakfast feel. The Salmon River Coffee Shop offers a classic diner breakfast, and the Junkyard Bistro has an enthusiastic following. Bicycle and ski rentals are available at the Hub (ridesalmon.com/#!the-hub/c4it). The Pines Motel and Guest Haus (thepinestetonvalley.com) in Driggs qualifies as cozy. Food stops might include Pendl’s Bakery & Café (pendlspastries.com) and Teton Thai (tetonthai.com/driggs) in Driggs. Fitzgerald’s Bicycles (fitzgeraldsbicycles.com) in Victor rents fat bikes for $35 a day, as does Peaked Sports (peakedsports.com) in Driggs. Sun Valley Resort (sunvalley.com) regularly posts discount accommodations. 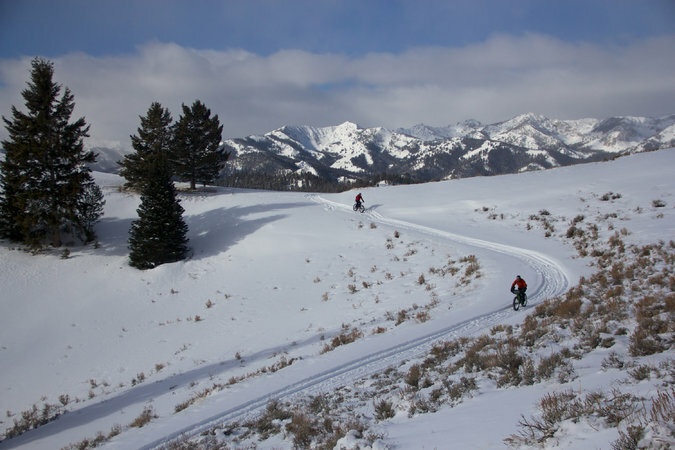 Sun Valley Trekking (svtrek.com) offers guided backcountry skiing and biking with self- and full-service access to its six hut and yurt locations. From $175 for five for a self-guided weeknight to $350 for 10 spots on weekends; guide services from $110 per guest with a group of three and one guide on a day tour. The Powerhouse Pub and Bike Fit Studio (powerhouseidaho.com) in Hailey calculates your best bicycle dimensions — and offers dozens of international beers. Fat bike and ski rentals are available in Ketchum at Backwoods Mountain Sports(backwoodsmountainsports.com), the Elephant’s Perch (elephantsperch.com) and Formula Sports (formulasports.com). Rentals from $35 to $45.